Well before artists were their own entrepreneurs and entrepreneurs became rock stars, A&R pros improvised a blueprint for the workings of the modern music industry. Let's all be clear about this: musicians didn't invent the music industry. Their stock-in-trade, after all, is artistry, accomplished through some mixture of alchemy and grind. It is another class of hustlers and entrepreneurs that create the venues for the music to be found, and then monetize: performance spaces, sheet music (in the 1920s), and eventually records. These are the things that make it possible for music to be considered a business. But the people in the "music business" don't do it alone, either. There's a critical third component in the chain between the artists and the money men. These are the people who, beginning in the 1920s, work directly with the artists, negotiating everything from what songs to record to how and when they will get paid. They help the musicians shape how the music will sound (or, in some cases, politely suggested how it ought to sound). And once the tunes are recorded, they figure out which ones to push into the marketplace, and how to get them there. In the music industry's budding stage, there was an art to this work, as it turned out, but no one would exalt the business men on the level of the actual performers, and justifiably so. Street-level business acumen (call it an informed gut sense, since there was nothing approaching what we'd now consider formal market research) was essential to their success, but no one would think of them as businessmen, and perhaps unfairly so. They existed in a nether ground of our knowledge of the music business, even as their general job title and function existed within the industry structure, at least until the digital age. That title was A&R, short for Artists and Repertoire, a title that seems to have evolved during the early '20s. They could have been Managers, Directors, Vice-Presidents or Glorified Interns of it, but that part of their title was irrelevant. A&R said it all, even if it meant different things at different labels. One could deride them as gatekeepers, but they were often also facilitators, recognizing artists who, with the right help, could make some pretty good music. For many years, they were the ones responsible for turning that music into records, and those records into revenue. Yet today, even the most successful and influential of the early music business men -- Ralph Peer, Polk Brockman, Art Laibly, J. Mayo Williams, Don Law and John Hammond among them -- are barely known outside the community of music history nerds. 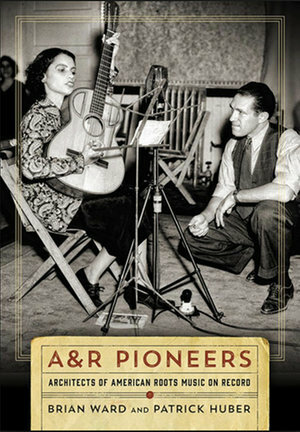 That probably won't change with A&R Pioneers: Architects of American Roots Music on Record, a rich and detailed exploration of their work by musicologists Brian Ward and Patrick Huber that will have its greatest appeal strictly among said music history nerds. But they earned this historical tribute: well before artists were their own entrepreneurs and entrepreneurs became rock stars, A&R pros improvised a blueprint for the workings of the modern music industry. But in order to appreciate their impact, let's deal with the book's subtitle. During the years chronicled here (the '20s to the mid-'40s), no one used the term "roots music". That's a modern marketing concoction, meant to encompass the music we now think of as the undiluted, sacrosanct essence of all the pop music that came after it. But during these years, this was pop music, whether framed as blues, folk, old-time, country or "ethnic". The intention behind recording this music wasn't to preserve an endangered way of life, celebrate America's cultural diversity, or any such noble aspiration. The object was to make a buck. Ward and Huber walk us through all the hats A&R people wore in order to make that buck. They were talent scouts, conducting cattle-call auditions for performers and following up leads from regional contacts. They were in charge of determining how much those artists would be paid ("few of the formal contracts or the many less formal incentives offered to artists and songwriters," the authors dryly note, "were models of unbridled generosity"). Many A&R pros worked on gathering material for the artists to record (the "R" in their title), and more than a few of them managed to get their names on more than a few of the copyrights. Some also supervised the actual recording sessions, a function that morphed into the "producer" role after World War II. Then, having determined which recordings had the most commercial potential, they shifted into marketing mode, working on print ads and placing product at retail stores. Within each of these roles, there was no baseline of performance, execution or conduct, besides keeping the label bosses happy. Being mavericks of a sort to begin with (the key figures Ward and Huber profile came into the business from different routes), they all hit on novel -- if sometimes most questionable -- ways to get those jobs done, all of them effecting a crowdsourced creation of standard industry practice. By no measure can we say they always acted honorably. In addition to financial deals that benefitted the label (and/or the A&R pro) far more than the artist, they weren't at all hesitant about playing into racial stereotypes on both sides of the line. For blues artists, many of the print ads deployed grossly broad caricatures. More crucially, they helped codify the distinction between the music targeted to blacks and the music targeted to whites, even as the music itself often straddled both worlds. A&R men (and they were almost all men), in developing a system for cataloging releases, hit upon the idea of separate catalogs, or "series", for blues ("race records") and country records (early terms for it were "old-time", an apparent nod to white consumers' perceived angst over modernity, and "hillbilly"). Needless to say, integrated recording sessions were clearly the exception, and artists were expected to stick to the assigned characteristics of their assigned genres. They also engaged in a degree of censorship, negating recordings with overly suggestive lyrics well before parental advisory stickers. Yet their impact can't be denied, and Ward and Huber celebrate their many successes and collective ingenuity. For better or worse, they were the people directly responsible for recording and marketing a staggeringly wide variety of highly popular music, which would go on to spawn much of America's continuing musical legacy. Their achievements led to the formalization (and, yes, eventual corporatization) of the music industry after World War II. For many of them, their hard-earned smarts and deep industry knowledge helped them navigate that transition, even as their traditional functions increasingly became siloed off from each other. Along the way, the authors present a treasure trove of fascinating backstories: an unpacking of the various myths surrounding Robert Johnson's 1936 recording session in a San Antonio hotel; a promo picture of the Kentucky Thoroughbreds looking more like milkmen than a guitar-fiddle-mandolin trio; the beginnings of country music's mainstream acceptance in the '30s and '40s (thanks in large part to A&R pro Dave Kapp's idea to get pop artists to cover hillbilly tunes). Ward and Huber went deep into the historical weeds for A&R Pioneers, but the book doesn't read that way at all -- especially if you're a music history nerd. If you're not one, all the catalog numbers and long cast of characters might be more detail than you need. If so, think of it this way: this book doesn't just chronicle the roots of the music industry, it sheds new light on the music itself. The hundreds of performers cycling through this book, including many even music history nerds might not know much about, get credit for being something more than lowbrow savants who somehow managed to luck up and make history. They went after an opportunity, dealt with whatever was handed them (or not), and made it work. But somebody had to give them a shot in the first place, which is why this book fills a glaring gap in our appreciation of American pop music. It's no cheat to those performers that the people who got their music to market finally get their own shine, even if those people often engaged in dubious practices. In a way, the early A&R pros were like the artists themselves, making a way for themselves in a business where rules and standards were made up on the fly. As the artists were creating the sounds, the A&R pros were creating the processes. It wasn't always pretty; there's more than one trip through the sausage factory throughout A&R Pioneers. But let's all be clear about this: for all their conniving and scheming, A&R pros displayed a lot of creativity and savvy to make hit records happen (as well as, to be sure, a lot of crap). Without those hits, we don't have a glorious musical heritage -- or a music industry.